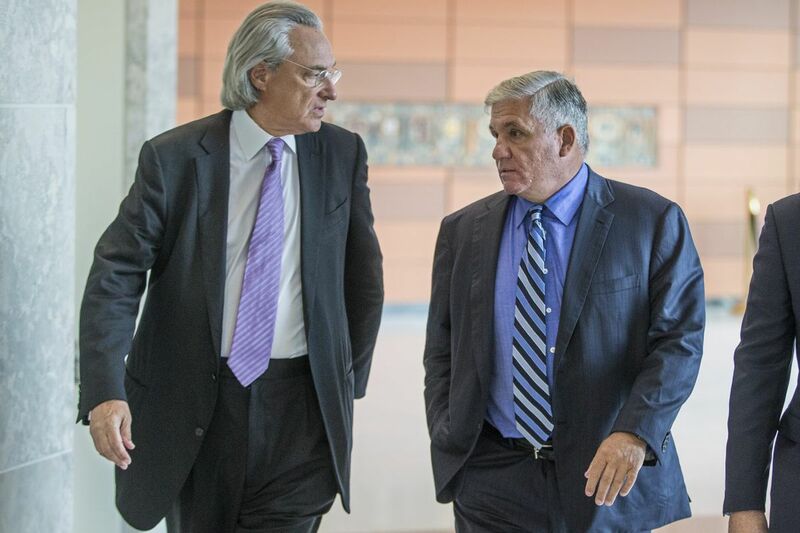 Attorney Thomas R. Kline (left), representing the Finocchiaro family, speaks wth Robert Mongeluzzi, representing another family whose son was allegedly killed by Cosmo DiNardo. When Cosmo DiNardo and his cousin Sean Kratz picked up Dean Finocchiaro on July 7, Finocchiaro was expecting to buy marijuana from DiNardo. DiNardo did not have marijuana with him in his truck that day, Kratz later told police. He thought his cousin's plan was to rob Finocchiaro. But what followed — the killing of Finocchiaro and two other young men at DiNardo's family farmland in Bucks County — was more than a robbery, Kratz later told investigators. "He used the word massacre," Bucks County Detective Martin McDonough testified Thursday. He said Kratz was so upset by what happened at the Solebury property that he "claimed he threw up." Yet after DiNardo and Kratz killed Finocchiaro and two other men, and left their bodies burning in an oil tank, McDonough said, the two men went to eat at Steve's Steaks in Philadelphia. Those details emerged at a Doylestown hearing as Kratz, 20, of Philadelphia, was ordered held for trial on charges that he was a co-conspirator in killing and burying Finocchiaro, Thomas C. Meo, and Mark R. Sturgis on the DiNardo property on July 7. DiNardo is charged with murdering those men plus a fourth, Jimi T. Patrick, two days earlier. DiNardo waived his preliminary hearing Thursday morning. Appearing via video from jail, the 20-year-old Bensalem man told Judge Maggie Snow, "I have no questions, your honor." The hearings were the first court appearances for the two men since the mid-summer search for the missing men and the discovery of their buried remains riveted the region. DiNardo and Kratz have been jailed without bail since their arrests, and now await formal arraignment on the charges next month. Prosecutors have not disclosed a motive for the murders, and say they may never find one. Still, the proceedings also drew dozens of relatives of the victims, who filled three rows in the courtroom. DiNardo's waiver of the hearing was not unusual; prosecutors said in July that he had confessed to the killings. In return for his cooperation and a guilty plea, Bucks County District Attorney Matthew Weintraub agreed not to seek the death penalty. No such promise has been made to Kratz, who is charged with three counts each of homicide, conspiracy, abuse of corpse, and other crimes. He entered the courtroom Thursday afternoon wearing a red prison jumpsuit and walking with a severe limp; his lawyer said he had been shot 19 times in an unrelated matter this year. Relatives of the victims arrive for the preliminary hearings of Cosmo DiNardo and Sean Kratz at the Bucks County Courthouse in Doylestown. He sat between his lawyers as McDonough, the only witness called to the stand, described the 3½-hour interview Kratz gave police on the night of his arrest. He said Kratz told police that he and his cousin had only hung out for a few weeks or months before the murders, and that the day of the July 7 killings was his first time at the DiNardo family farm in Solebury, according to the detective. "But during that short time, Cosmo would brag about hurting people and killing people, just in general," Kratz told police, according to McDonough. In his confession to police, DiNardo said Kratz committed one of the July 7 murders. Though his lawyer, Kratz maintained that DiNardo killed Finocchiaro, Meo and Sturgis. But he also told police that he stayed with his cousin on the property, stayed the night with DiNardo at his home in Bensalem, and returned with him to the property the next day to bury the bodies. On the night of his arrest, investigators pressed Kratz several times to tell them where murder weapons were, McDonough said. Kratz initially denied knowing where they were, but eventually relented. Around 2 a.m., the detective said, Kratz and his mother led police to Kratz's aunt's property in Upper Dublin, where he had hidden the guns. Neither prosecutors nor Kratz's lawyers offered arguments before the judge at Tuesday's hearing beyond questioning McDonough. Snow delivered her ruling from the bench immediately after the testimony. Kratz had no reaction as she ordered him held for trial on all the charges. After the hearing, his lawyer said none of the testimony implicated him in the commission of the murders. "What we heard is that my client places himself at the scene of these killings, and that is all he said so far," lawyer Craig Pengalese said. The families of the victims left the room without commenting. Some had cried as they listened to the testimony. "The Finocchiaros have been doing terribly," their lawyer, Thomas R. Kline, said. "All inexplicable, all tragic, all unnecessary. They're committed to seeing that Mr. DiNardo spends the rest of his life in jail."